I love hike picnics. Exploring and wandering are made infinitely more enjoyable when you know that a delicious meal is waiting for you. I used struggle with what to pack. Thanks to the Smitten Kitchen cookbook by Deb Perelman, I struggle no more. 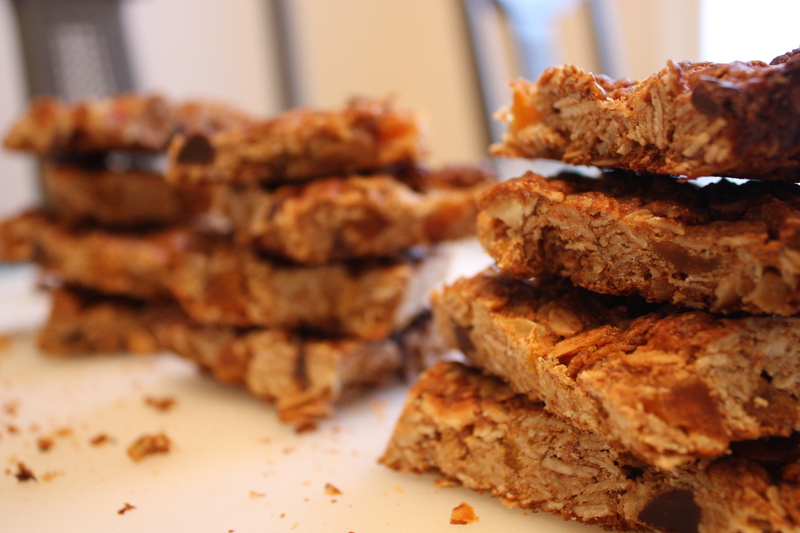 These granola bars (only slightly changed from her recipe) have taken over my life. I make them often and when I’m not making them I’m either eating them or thinking about eating them. Plus they are incredibly easy to make. What more could you want? Preheat your oven to 350 degrees. Grab a 8-by-8 inch pan and line it with enough parchment paper that it comes up the sides. 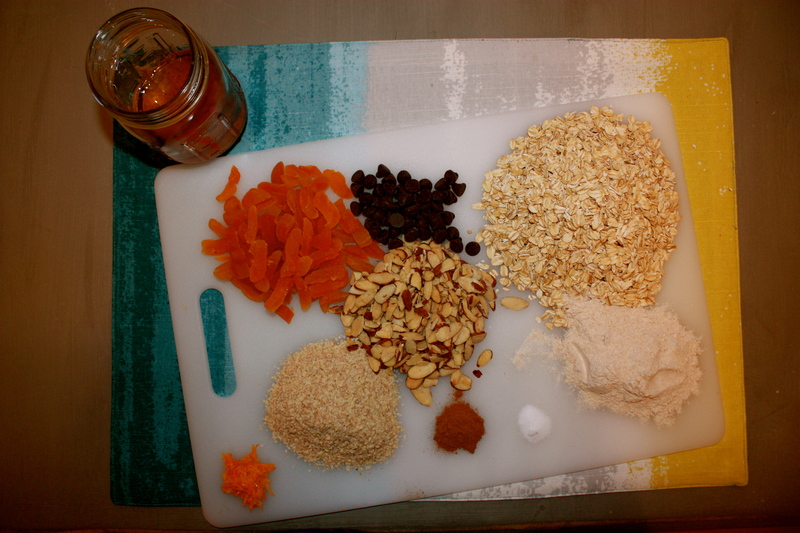 Mix all of the dry ingredients together (the orange zest is a tricky one and falls into the wet category, not the dry). In a separate bowl, whisk the wet ingredients together until smooth. 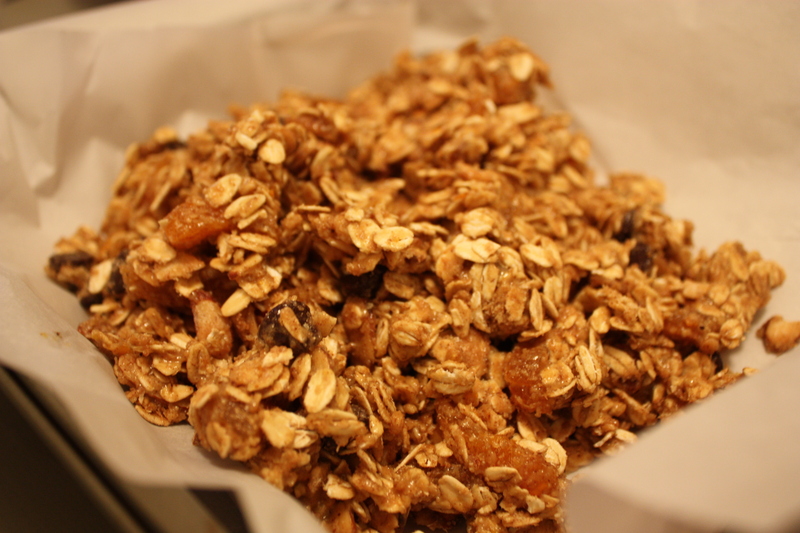 Pour the wet ingredients over the dry ingredients and mix together until everything is evenly coated. Then pour the mixture into the pan, pressing firmly (you actually have to press really, really hard for the bars to hold together later). Bake for 20-25 minutes and remove from oven when the edges turn a dark brown and the top starts to take on a little color. Let cool for 10 minutes in the pan then pull out and continue to cool. When completely cool, cut with a serrated knife. Then, after you’ve eaten a bar or two, stick these bars in an airtight container and eat them on your next hike (if they make it that long). This entry was posted in Stuff we love and tagged baking, breakfast, delicious, food, hiking food, taste. this looks deeeeeliiiiiciiiiouuuuusssss!! gotta try this out!! !